During today's Braves-Giants game, Giants manager Bruce Bochy pinch hit for first baseman Brandon Belt with Justin Christian in the top of the eighth inning. 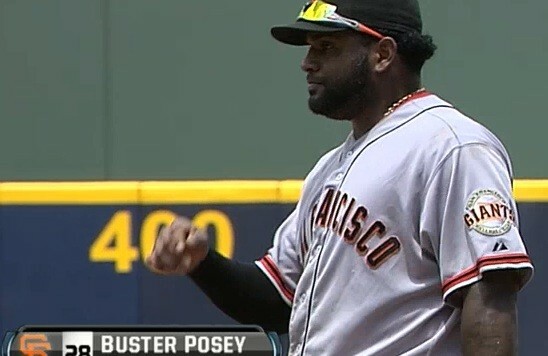 The SportSouth technical team apparently expected Buster Posey to move from behind the plate to first…but instead, Posey stayed behind the plate, Joaquin Arias came into the game to play third base, and Pablo Sandoval moved from third to first to take over for Belt. Thus, we get this graphic, claiming Posey is the first baseman while the camera is trained on Sandoval…who is about as far from Posey as you can get. Braves announcers Chip Caray and Joe Simpson reacted to the mishap the way they usually do…by staying silent with the camera focused on Arias at third, and staying silent for a second or two before mentioning "uh, that's not Posey at first…' when the camera is focused on Sandoval and the Posey graphic is put up. The Braves went on to win the game 3-2 to salvage the final game of the three game series.